Best known for creating earlt Steam Engines, Cornish Inventor and Mining Engineer Richard Trevithick Sadly died on April 22 1833 at the Bull Hotel, Dartford After spending a week in bed with pneumonia. Born13 April 1771 in Tregajorran, Cornwall. Trevithick was an engineer at a mine in 1797 who with the help of Edward Bell pioneered the use of A high pressure steam engine. His first success was On 21 February 1804 when the world’s first locomotive-hauled railway journey took place when Trevithick’s unnamed steam locomotive hauled a train along the tramway of the Pen-y-darren Ironworks, near Merthyr Tydfil in Wales. However he ran afoul of Matthew Boulton & James Watt, who held a number of Patents for steam engines. He improved boiler technology allowing the safe production of high pressure steam, able to move pistons in steam engines instead of using atmospheric pressure. William Murdoch, who lived next door to Trevithick, demonstrated a model steam carriage to Trevithick in 1794. Both Oliver Evans in the U.S. and Arthur Woolf were also experimenting on a similar engine. 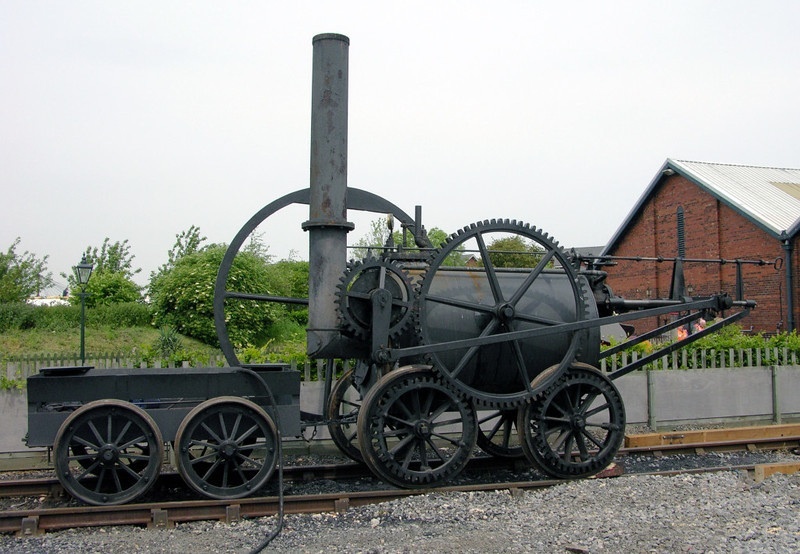 However Trevithick actually made high pressure steam work, eliminating the need for a condenser, and allowing the use of a smaller cylinder, Making the engine more compact, lighter and small enough to carry its own weight with a carriage attached. Trevithick built his first stationary models of high pressure steam engines, then attached one to a road carriage. Exhaust steam was vented via a vertical chimney, thus avoiding a condenser and any possible infringements of Watt’s patent, with linear motion being converted into circular motion via a crank instead of a beam. 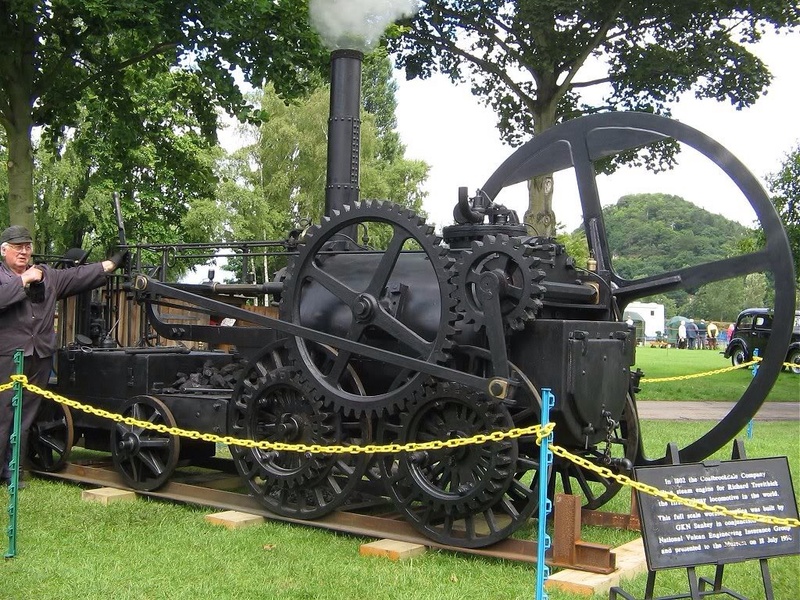 Trevithick built a full-size steam road locomotive in 1801 in Camborne. He named the carriage ‘Puffing Devil’ and, on Christmas Eve it successfully carried seven men from Fore Street up Camborne Hill, past Camborne Cross, to the nearby village of Beacon with his cousin and associate, Andrew Vivian, steering. This is inspired the popular Cornish folk song “Camborne Hill”. However, a steam wagon built in 1770 by Nicolas-Joseph Cugnot may have an earlier claim. During further tests, Trevithick’s locomotive was prone to break down and on one occasion the Boiler was allowed to run dry and the machine exploded. Trevithick did not consider this a serious setback, but rather operator error. In 1802 Trevithick took out a patent for his high pressure steam engine. To prove his ideas, he built a stationary engine at the Coalbrookdale Company’s works in Shropshire in 1802. 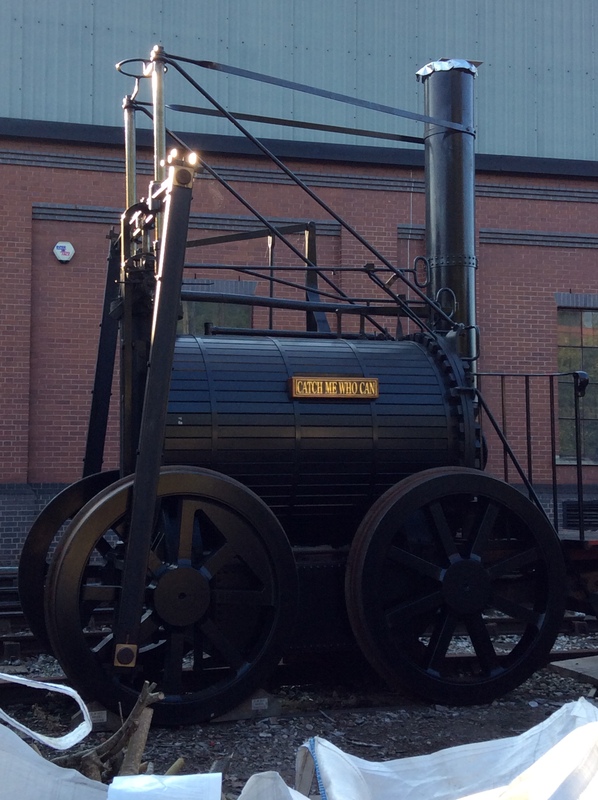 The Coalbrookdale company then built a rail locomotive for him, but little is known about it, including whether or not it actually ran. To date, the only known information about it comes from a drawing preserved at the Science Museum, London, together with a letter written by Trevithick to his friend, Davies Giddy. The design incorporated a single horizontal cylinder enclosed in a return-flue boiler. A flywheel drove the wheels on one side through spur gears, and the axles were mounted directly on the boiler, with no frame. Unfortunately The Puffing Devil could not maintain sufficient steam pressure and would have been of little practical use. In 1803 he built another steam-powered road vehicle called the London Steam Carriage, which attracted much attention from the public and press when he drove it that year in London from Holborn to Paddington and back. It was uncomfortable for passengers and proved more expensive to run than a horse-drawn carriage and so the project was abandoned. In 1802 Trevithick built one of his high pressure steam engines to drive a hammer at the Pen-y-Darren Ironworks in Merthyr Tydfil, South Wales. With the assistance of Rees Jones, an employee of the iron works and under the supervision of Samuel Homfray, the proprietor, he mounted the engine on wheels and turned it into a locomotive. In 1803 Trevithick sold the patents for his locomotives to Samuel Homfray. Homfrey was so impressed with Trevithick’s locomotive that he made a bet with another ironmaster, Richard Crawshay, for 500 guineas that Trevithick’s steam locomotive could haul 10 tons of iron along the Merthyr Tydfil Tramroad from Penydarren to Abercynon , a distance of 9.75 miles (16 km). Amid great interest from the public, on 21 February 1804 it carried 10 tons of iron, 5 wagons and 70 men the distance in 4 hours and 5 minutes, an average speed of approximately 2.4 mph (3.9 km/h). As well as Homfray, Crawshay and the passengers, other witnesses included Mr. Giddy, a respected patron of Trevithick and an ‘engineer from the Government’. The locomotive was relatively primitive comprising of a boiler with a single return flue mounted on a four wheel frame. At one end, a single cylinder with very long stroke was mounted partly in the boiler, and a piston rod crosshead ran out along a slidebar, an arrangement that looked like a giant trombone. As there was only one cylinder, this was coupled to a large flywheel mounted on one side. The rotational inertia of the flywheel would even out the movement that was transmitted to a central cog-wheel that was, in turn connected to the driving wheels. It used a high pressure cylinder without a condenser, the exhaust steam was sent up the chimney assisting the draught through the fire, increasing efficiency even more. A miner, named Francisco Uville bought one of Trevithick’s Hight Pressure Steam Engine for draining water from his silver mine at Cerro de Pasco, Peru. In 1813 Uville journeyed to England aboard the Falmouth packet ship ‘Fox’ coincidentally with one of Trevithick’s cousins on board the same vessel. On 20 October 1816 Trevithick left Penzance on the whaler ship Asp accompanied by a lawyer named Page and a boilermaker bound for Peru where he was consulted on mining methods. The government granted him certain mining rights and he found mining areas, but did not have the funds to develop them, with the exception of a copper and silver mine at Caxatambo. After serving in the army of Simon Bolivar he returned to Caxatambo but was forced to leave the area and abandon £5000 worth of ore ready to ship. Uville died in 1818 and Trevithick soon returned to Cerro de Pasco And After leaving Cerro de Pasco, Trevithick passed through Ecuador on his way to Bogotá in Colombia. He arrived in Costa Rica in 1822 to build mining machinery. However transporting ore and equipment, using the San Juan River, the Sarapiqui River, and the railway proved treacherous And Trevithick was nearly killed twice. He met Robert Stephenson in Cartagena And he gave Trevithick £50 to help his passage home. He arrived at Falmouth in October 1827. In 1829 he built a closed cycle steam engine followed by a vertical tubular boiler. In1830 he invented an early form of storage room heater, comptising of a small fire tube boiler with a detachable flue which could be heated either outside or indoors with the flue connected to a chimney. He was also invited to work on an engine of a new vessel at Dartford, Which involved a reaction turbine. Following his death Trevithick was buried in an unmarked grave in St Edmunds Burial Ground, East Hill, Dartford. The burial ground closed in 1857, with the gravestones being removed in the 1960s. A plaque marks the approximate spot believed to be the site of the grave. The plaque lies on the side of the park, near the East Hill gate. 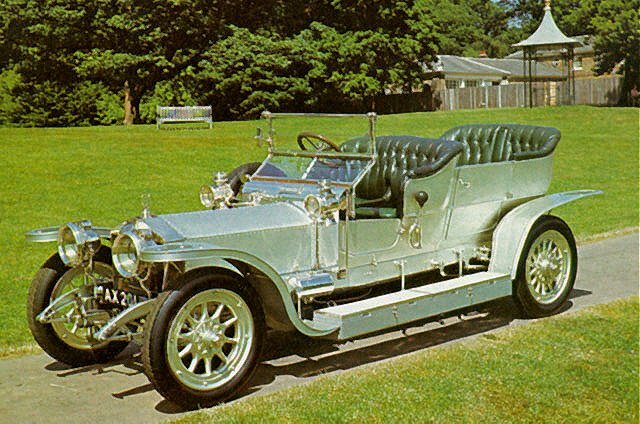 After the introduction of the Phantom model in 1925 this 40/50 model was referred to as the Silver Ghost. The new 40/50 was responsible for the company’s early reputation with over 6,000 built. In 1921, the company opened a second factory in Springfield, Massachusetts in the United States (to help meet demand), where a further 1,701 “Springfield Ghosts” were built. This factory operated for 10 years, closing in 1931. Its chassis was used as a basis for the first British armoured car used in both world wars.In 1931 Rolls-Royce acquired the much smaller rival car maker Bentley after the latter’s finances failed to weather the onset of the Great Depression. 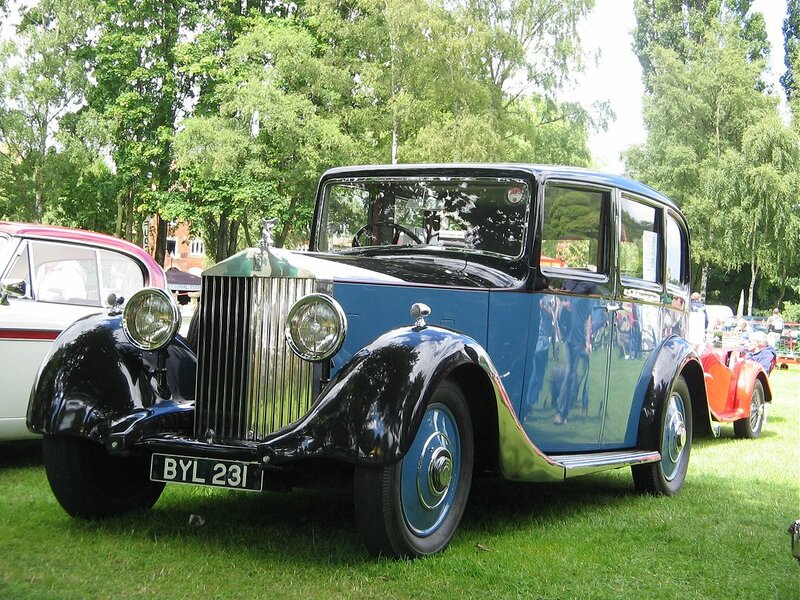 From soon after World War II until 2002 standard Bentley and Rolls-Royce cars were often identical apart from the radiator grille and minor details. In 1933, the colour of the Rolls-Royce radiator monogram was changed from red to black because the red sometimes clashed with the coachwork colour selected by clients, and not as a mark of respect for the passing of Royce as is commonly stated. Rolls-Royce and Bentley car production moved to Crewe in 1946 where they began to assemble complete cars with bodies from the Pressed Steel Company (the new standard steel models) for the first time. Previously they had built only the chassis, leaving the bodies to specialist coach-builders. Rolls-Royce also started to produce diesel engines in 1951. Initially, these were intended for heavy tractors and earth-movers but, later, they were installed in lorries (e.g. Scammell), railcars, diesel multiple units and Sentinel shunting locomotives. Rolls-Royce took over Sentinel’s Shrewsbury factory for diesel engine production in 1956. The Rolls-Royce diesel business was acquired by Perkins in the 1980s. In 1971, Rolls-Royce was crippled by the costs of developing the advanced RB211 jet engine, resulting in the nationalization of the company as Rolls-Royce (1971) Limited. In 1973, the car division was separated from the parent company as Rolls-Royce Motors. Rolls Royce also made Torque converters and railcar engines were often used with Twin Disc torque converters which were built by Rolls-Royce under licence from Twin Disc of the USA. “Twin Disc” is the name of the company (which originally manufactured friction clutches) and does not describe the construction of the torque converter.Sadly in 1971 Financial problems caused largely by development of the new RB211 turbofan engine led – after several cash subsidies – to the company being nationalised by the government. (Delay in production of the RB211 engine has been blamed for the failure of the technically advanced Lockheed TriStar, which was beaten to launch by its chief competitor, the Douglas DC-10. 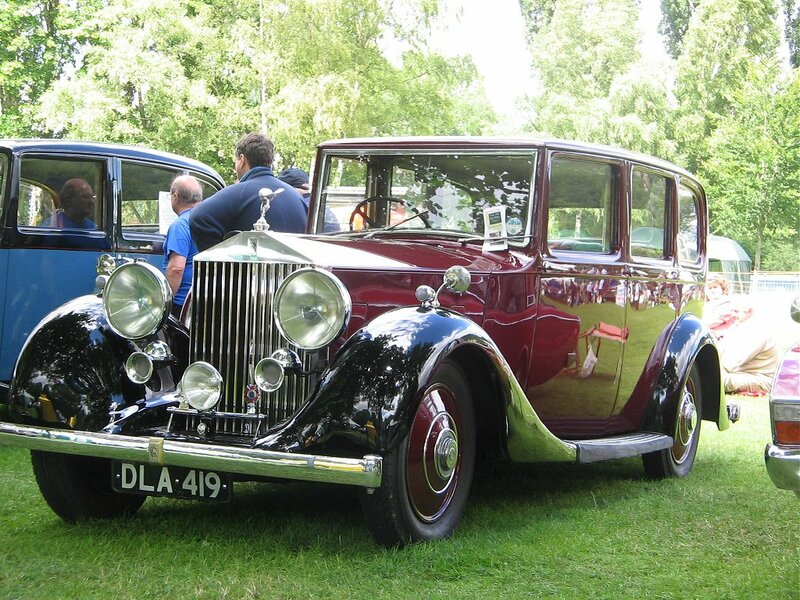 )In 1973 the motor car business was spun off as a separate entity, Rolls-Royce Motors. The main business of aircraft and marine engines remained in public ownership until 1987, when it was privatised as Rolls-Royce plc, one of many privatisations of the Thatcher government. Since then it has been bought by German Automobile Manufacturer BMW.